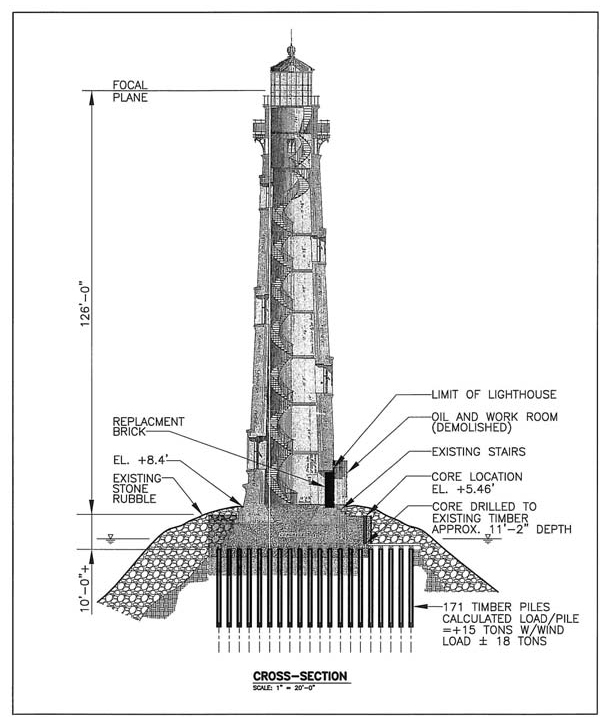 The foundation of the lighthouse is a significant structure, made up of 171 wood pilings that are interconnected by a timber grillage and overlain with 12 feet of concrete. The tower is approximately 28 feet in diameter at its base and is comprised of bricks, forming a wall that is six feet thick near the foundation. The plinth is the name of the eight-sided base upon which the circular lighthouse tower sits. The upper portion of the plinth is adorned with a brick feature covered in a cast iron ring that is collectively referred to as the cornice. The lowermost portion of the plinth consists of an extension of bricks at its base that are also covered by a cast iron ring. The granite rock framing the entrance door and five windows came from the remains of the old tower that was destroyed in the Civil War. The conical roof of the tower is covered in copper. Eight flights of spiral iron stairs provide access from the ground floor to the watch room where the light was once located. Each of the first six and the final eighth flights makes a half revolution within the tower. A landing is located at the top of each flight. The seventh flight makes a full 360-degree revolution of the tower prior to opening onto the watch room. Anchored within the brick walls of the tower, the iron stairs and landings do not require center supports which results in the tower being open throughout its center from the floor to the top.